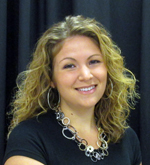 Posted December 10, 2012, in Staff News, We R Arts and Sciences Student Spotlight. A native of Gloucester City, Laura grew up not far from the Camden campus, and always knew that Rutgers-Camden was the school for her, partly because of her neighbor, a Rutgers alumnus who never missed a chance to boast about her alma mater. Her teachers at Gloucester City High School also encouraged her to attend Rutgers, and in Fall 2005 she entered Rutgers-Camden as a student in the Honors College, with plans to major in English. And then, on her first day on campus, she met Dr. Luis Garcia, Professor of Psychology, and everything changed. Laura was enrolled in Dr. Garcia’s Honors College seminar, “Psychology of Leadership.” She was immediately interested in the subject matter and enjoyed Dr. Garcia’s teaching style, and so took another course of his called “Psychology of Human Sexuality.” After learning that Dr. Garcia allowed students to research alongside him, Laura asked him about joining his research team, and he said yes. She was hooked. In short order, she decided to major in psychology as well as English, received her master’s degree in psychology from Rutgers-Camden in 2010, and now teaches the same Psychology of Human Sexuality class that changed her life, six years ago. Joining Dr. Garcia’s research team gave Laura the confidence to try new things and helped her to connect with the campus culture. She started to tutor for the Learning Resource Center and became an ambassador for the Office of Admissions. She also expanded her research horizons and started working with Dr. Charlotte Markey, Associate Professor of Psychology, after Laura took Dr. Markey’s class “Psychology of Eating.” Though conducting research with a faculty member can seem intimidating, Laura urges students to get involved. In her experience, the professors acted as guides, letting the students take on significant roles in the research process, enhancing their confidence and knowledge of the material. Laura is interested in eventually going back to school for her Ph.D., and that fact that she has already co-authored two peer-reviewed placations, presented her research at five academic conferences, and currently has a manuscript submitted for publication will give her a serious edge. Currently Laura is trying a new role, as teacher rather than student. While teaching the Psychology of Human Sexuality course has been challenging, Laura loves teaching. Introducing her students to the topics that so captured her imagination years ago is particularly rewarding. She cites three Rutgers-Camden professors – Dr. Garcia, Dr. Markey, and Dr. Courtenay Cavanaugh, Assistant Professor of Psychology – as her inspiration in the classroom. In addition to her scholarly duties, Laura serves as the Program Coordinator for the Honors College and the International Studies Program. She’s spent four years in this role, moving up from a part-time administrative assistant to her current full-time position. The Honors College currently has 360 students, so she, Dr. Timothy Martin, who serves as Director, and Dr. Robert Emmons, Assistant Dean, are always busy, advising students on what classes they should take, and organizing events like their recent Election Night Registration Party, which brought Honors College students together in order to watch the presidential election results and construct their spring schedules simultaneously. Clearly, Laura and Rutgers-Camden are inextricably linked. She is most enthusiastic about that campus, saying, “I don’t know where I’d be without Rutgers-Camden.” Forever grateful, she has a few words of wisdom for all Rutgers-Camden students: “Take every opportunity that comes your way. Get involved, get connected, and don’t be shy!” We encourage everyone to take her advice – it might just change your life. Page last updated by Faculty of Arts and Sciences at 11:54 am October 25, 2017 . This page was printed from http://fas.camden.rutgers.edu/2012/12/10/laura-goins/ at 9:24 AM Friday, April 26, 2019.